For something that calls itself a “permaculture blog”, I do chunter on about a lot of other stuff. So, please find below, an unashamedly, unequivocally and un-something-elsely blog about permaculture. Permaculture very much takes natural eco-systems as example and guide. Balance and symbiosis are key words. Despite my permacultural professings, when creepy-crawly critters and bugs stop by to eat our veggies, my first reaction is to feel that I’ve just discovered burglars in my house and that I want to get rid of them immediately by reaching for some chemical mix in a spray gun. One can even justify this course of action to oneself by choosing chemicals approved for organic gardening. But, you know, organic gardening approved poisons are still poisons and very often kill insects indiscriminately, i.e., the good with the bad. (Read an earlier blog on the subject). Permaculture rather suggests that we observe first, trying to work out why we have a problem: is it a deficiency or an excess of something that could be easily ameliorated? And then we’ll think of how to solve the problem by working towards equilibrium, a natural balance. Permaculture gardeners are therefore happy to accept a low-level infestation of bugs as bad bugs are food for good bugs (bad and good as seen from my vegetable-eating standpoint) and if there’s no food for the bug-eating bugs, then the bug-eating bugs don’t hang around and when the bad bugs arrive, you’ve got yourself a problem. 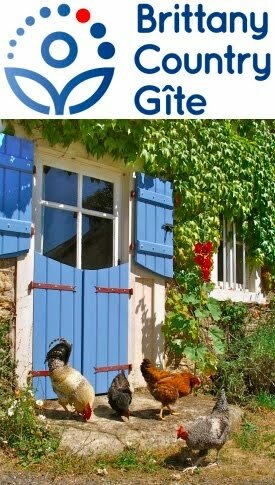 The other day, I was giving a tour of our permaculture smallholding to some English guests of our neighbours’, Paul and Christiane’s, gite and explaining to them how we did things. It turns out that Alan works in the horticulture industry and he started turning over leaves and looking at them with an expert's eye. We’ve certainly had some aphid damage but it was, and remains a low-level infestation that really isn’t hurting the plants, so we’ve done nothing. The video below shows you some of our pepper plants, which are growing healthily, in spite of some aphids on them. In our vegetable plot, saying that this was exactly what I was talking about, he pointed out a ladybird (ladybug) larva, right next to a worry of aphids (see photo at top). 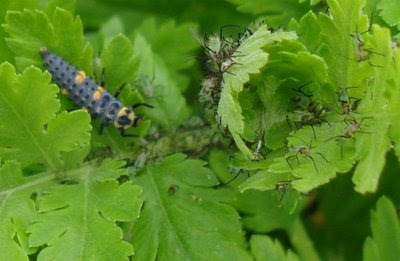 Lady bird/bug larvae eat aphids for breakfast, dinner and tea. As this is in the strawberry patch and the aphids were chomping in the wild chrysanthemums Gabrielle has inter-planted, rather than the strawberries and they were being followed by ravenous aphid-eaters, we can again feel happy to leave well alone. A caveat: such equilibrium takes a while to establish itself. You’re looking for biodiversity and good soil and that takes a year or two or three to get settled, so you have to have strong nerves in the set-up stage. If you weaken and spray, you’ll be killing the good bugs, the bug-eating bugs too. I am infested with clothes moths - are they on the ladybird's menu too? As an organic grower I would dispute the inference that organic growers will resort to approved chemicals as soon as there is a pest infestation. We haven't used any pesticides for many years now and we follow much the same principles as yourself. In my opinion the only way to sustainably grow our food is to find the balance between pest host and predator. But this is an organic principle as well as a permacultural one. Thanks for your comment, Phil. I don't think I meant to infer that organic growers would resort to approved chemicals as a first resort, more that my own reaction, on seeing a damaging infestation was to act against what we say we believe in and want to do something drastic to immediately alleviate the problem and that a justification could be that it was an "organic-authorised" chemical. Neither, on a more general level, would I want anyone to think that I was setting permaculture against organic gardening, clearly there is much overlap and much that each discipline can give to, and learn from, the other. I like your own blog and have added it to our sidebar.